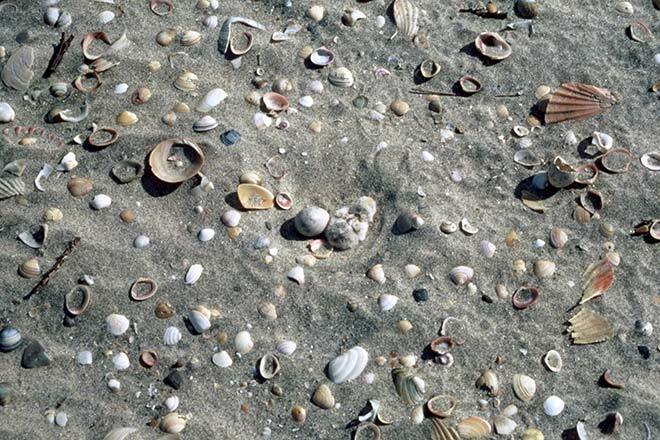 Well camouflaged among the shells and sand, a tiny fairy tern chick sits beside an egg (centre). They are so small, they would barely count as a canapé for a hungry predator, yet stoats, rats, hedgehogs, cats, dogs and gulls pick them out. New Zealand’s subspecies of fairy tern is extremely endangered. The Department of Conservation (DOC) is attempting to save them from extinction by protecting them from predators and vehicles. Just four pairs were breeding in 1996, but in 2015 DOC estimated that there were about 12 breeding pairs.